Even after ALS had silenced her vocal chords, Barbara Brenner’s powerful voice continued to send tremors into the medical establishment. With the assistance of a text-to-speech computer program, Brenner, the former executive director of Breast Cancer Action, sent stinging missives to the head of the ALS clinical trials program and Food and Drug Administration officials, and continued her less public work of advising others dealing with ALS and breast cancer. Brenner died from complications of ALS (amyotrophic lateral sclerosis, a progressive neurodegenerative disease that affects nerve cells in the brain and spinal cord, leading to death) on May 10, 2013 at age 61 at the home she shared with her partner of 38 years, Suzanne Lampert, in San Francisco. Brenner was 41 when she was first diagnosed with breast cancer. Her diagnosis led the lawyer and activist to join the board of Breast Cancer Action (BCA), a grassroots advocacy organization in San Francisco started by women with breast cancer. A year later, she became the organization’s first full-time executive director. Under Brenner’s leadership, BCA grew into a national organization, and one that changed the conversation in breast cancer advocacy from building awareness to demanding research on causes and prevention. 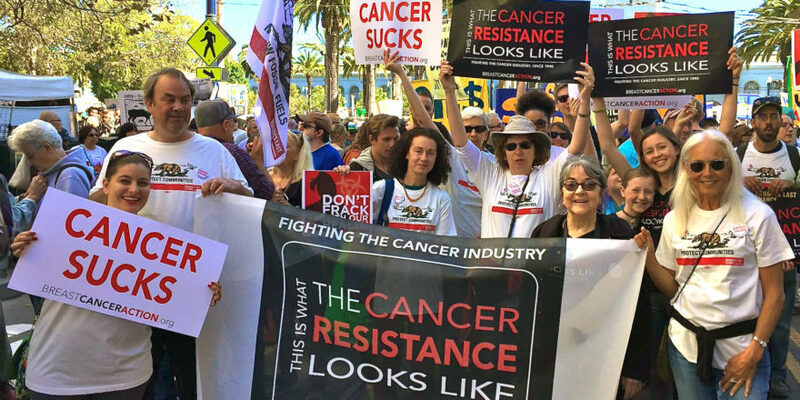 BCA became the first breast cancer organization to refuse funding from any corporation that profits from cancer or contributes to cancer by polluting the environment. It was such a surprising policy that it was written up in the Journal of the National Cancer Institute. The policy also unleashed the organization’s ability to take on daunting targets, such as big pharmaceutical companies, and groups once seen as untouchable, including the Susan G. Komen Foundation, that collaborate with corporations that endanger women’s health. These were difficult decisions for the BCA board and membership. Brenner worked hard to explain the policy: “In our health care system, which is driven primarily by private profit, most of which goes to corporations, public messages about breast cancer tend to serve profits, not people,” she wrote in The Source, the BCA newsletter. “If you follow the money, you can pretty much tell what positions people and organizations will take on breast cancer issues,” she wrote, citing the example of the fast track approval that the FDA gave to Genentech for its drug Avastin for use in treating breast cancer. BCA had opposed approval because the drug had deleterious side effects and there was no evidence that it extended the life of breast cancer patients. Cancer organizations that received funding from Genentech were silent. Three years later, the FDA withdrew its approval. BCA targeted everything from pink buckets of Kentucky Fried Chicken and pink-lidded Yoplait yogurt to “Clean for the Cure” Eureka Vacuum Cleaners and pink Ford cars. Brenner’s sharp critique was highlighted in the 2012 film, “Pink Ribbons, Inc.” and even cited by Stephen Colbert. Medical sociologist, Gayle Sulik, author of Pink Ribbon Blues said, “Barbara Brenner was powerful, at times obstreperous. She never seemed to be afraid to call things as she saw them, and it didn’t seem to matter who got upset about it. Barbara reminded us that sometimes it takes ruffling a few feathers to dislodge complacency. “Who will push us to stretch our minds and abilities until we pave a new road in breast cancer? Who will remind us that if we are comfortable with the pink ribbon state of affairs, then we are part of the problem? It’s up to us now,” Sulik added. Another controversial issue that Brenner took on was the over-promotion of mammograms. She wrote, “The dominant message about mammography is that it will save your life. That message is so oversimplified as to be dishonest. Mammograms can only be life- saving if they find a cancer that is treatable and if the woman gets treatment in a timely way – and one of the known causes of breast cancer is ionizing radiation, the kind you get from medical X-rays.” She warned that the science about the potential harm of over use of mammography was being discounted or ignored. Her position was recently confirmed by the FDA, which revised its recommendations concerning the frequency of screening mammograms for healthy women. 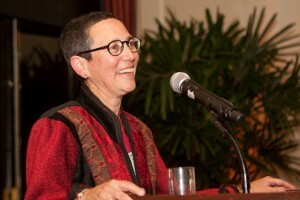 Judy Norsigian, executive director of Our Bodies, Ourselves, said that Brenner’s leadership among breast cancer activists and the wider women’s health movement is legendary. “So often it was her unique combination of guts, tenacity, brilliance and good humor that inspired the rest of us to keep our social justice goals front and center,” Norsigian said. Known for her eloquence and wit, Brenner was a much sought after speaker and media commentator. She made complicated medical issues and environmental science understandable to grassroots activists and breast cancer support groups; at the same time she was unflinching with her critiques of hypocritical corporate policies at national professional meetings. “We serve no purpose in being nice,” she told Ms. Magazine in 2005. Brenner’s activism started early. Raised in Baltimore in a family of seven children, she remembers hearing Martin Luther King, Jr. when her mother took her to a civil rights march at age 10. At Smith College she was active in the anti-war movement, including shutting down the campus in 1970 as a protest against the war. At graduate school in Princeton, she came out as a lesbian in the early 70s, and the experience radicalized her. It was there that she met Lampert and they formed a bond that was to endure for four decades. Together they moved to Los Angeles, Lampert’s hometown. Brenner started working with the women’s rights project of the ACLU of Southern California, where she realized how the law could be used to effect positive change. It led her to attend UC Berkeley Boalt Hall School of Law (now Berkeley Law School) and intern at the ACLU of Northern California in San Francisco. After law school, she clerked for U.S. District Court Judge Thelton Henderson, a distinguished jurist who had been the first African-American to work for the Civil Rights Division of the U.S. Justice Department. She later became a partner at Remcho, Johansen & Purcell, a California law firm specializing in public policy and constitutional issues. Brenner also formed her own firm with Donna Hitchens, working primarily on civil rights and employment discrimination. “Barb was a zealous, smart and compassionate advocate for her clients and was never intimidated by her opposition even when they were far more experienced and better financed. She was a wonderful law partner,” said Hitchens, now a retired judge of the San Francisco Superior Court. As a lawyer, Brenner served on the affiliate and national boards of the ACLU, and volunteered as a cooperating attorney on civil liberties cases. Brenner’s expertise on civil liberties and breast cancer advocacy were joined last month [in April] when the ACLU was before the U.S. Supreme Court challenging human gene patents, specifically those genes that indicate a predisposition for breast cancer. Brenner immediately understood the effect this would have on the lives of millions of women and their families. Breast Cancer Action was the only breast cancer organization to stand up as a plaintiff in the case. Though she was involved with health policy on a national level, Brenner always found time to provide compassionate advice to countless women who contacted her when they received a breast cancer diagnosis. Although debilitated with ALS, she became adept at using technology and social media to continue to consult with newly-diagnosed women and to share her expertise and experience about ALS as well. On her blog, Healthy Barbs, she wrote both about her own daily struggles with ALS and about her anger over profit-driven health policies. She also used social media, including Facebook, to provide play-by-play accounts of her beloved San Francisco Giants. Lampert described Brenner as “living with ALS instead of dying of ALS.” Until the last week of her life, she enjoyed going on “roll and strolls” in Golden Gate Park and other favorite places in SF; attending plays and concerts, and carrying on a lively e-mail correspondence with friends and relatives around the country. Brenner was awarded numerous honors, including a Jefferson Award for Public Service in 2007. In 2012, Brenner was honored by her alma mater with the Smith College Medal and by the ACLU of Northern California with the Lola Hanzel Courageous Advocacy Award. In addition to Lampert, Brenner is survived by her siblings Joseph S. Brenner, Mark A. Brenner, Nanci E. Grail (Donald Grail), Richard D. Brenner (Barbara), and Lawrence M. Brenner (Roderic Hooks), and eleven nieces and nephews, all of whom live in the greater Baltimore area. She is predeceased by her parents, Morton A. and Bettie B. Brenner, and her sister Ruth B. Newman. At her request, contributions in lieu of flowers may be made to the Barbara Brenner Rapid Response Fund at Breast Cancer Action.